WASHINGTON — For the first time in nearly four years, the US Navy has four aircraft carrier strike groups deployed at the same time. Two more carriers are carrying out local operations, making for six of the fleet’s ten active carriers underway — an unusually high percentage. And another is preparing to go. 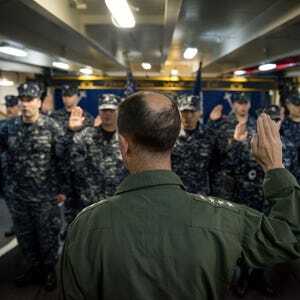 The departure June 4 of the Ronald Reagan from Yokosuka, Japan, coupled with the June 1 deployment of the Dwight D. Eisenhower group from the US East Coast, doubled the number of deployed groups. The Harry S. Truman is in the eastern Mediterranean conducting combat strikes against ISIS targets in Syria and Iraq, and the John C. Stennis group is continuing operations in the South China Sea. Closer to home, the Carl Vinson and George Washington are cruising off the West and East coasts, respectively, undergoing qualifications and training. A seventh carrier, the Norfolk-based George H. W. Bush, is expected to be underway for training operations in June, preparing to deploy later this year. The last time four strike groups were deployed simultaneously was over a nine-week period from late August 2012 to early November 2012, a Navy spokesman said. It’s not clear when the last time six or more carriers were underway. The moves are not in response to a specific crisis. “It’s all been in the works for months as part of the Global Force Management program,” a Navy official said, referring to a joint Pentagon plan that guides major deployments of US military forces. The level of flattop activity is noteworthy on two counts. Deployments were noticeably cut back starting in late 2012 and early 2013 in response to spending restrictions caused by mandated budget cuts under sequestration rules. The services are still struggling to build up operating funds — just last month, the Navy informed Congress of an $848 million shortfall in fleet-wide readiness accounts, $91 million of which was directly attributable to extending the Truman’s deployment an extra 30 days to operate in the Mediterranean. But despite the cost, few military displays carry more symbolism than a carrier deployment. Navy officials have said since last year that carriers would spend more time in the Mediterranean Sixth Fleet region rather than simply passing through en route to Fifth Fleet operating areas in Central Command — an effort to counter the growth in Russian operations in the eastern Med off Syria. Truman, after leaving Norfolk in November, spent the bulk of her deployment in the Persian Gulf and Arabian Sea, but passed through the Suez Canal on June 2 to enter the Mediterranean. In the Pacific, the Stennis has operated exclusively in the western Pacific since beginning its deployment in mid-January, a distinct change from recent WestPac tours that generally saw the carrier spend more operating time in the Indian Ocean/Arabian Sea/Persian Gulf region. But Stennis has spent far more time in the South China Sea, re-establishing a continuing presence as a counter to China’s extensive growth there. Stennis and her escorts generally have not directly challenged Chinese territorial claims around artificial islands built up in the South China Sea, even as the warships’ presence sends a clear message of interest. “We’re trying to not be too provocative,” acknowledged a US Navy official. “But we’re working to get used to operating in close proximity to a close competitor navy. It was an important learning experience for us to get used to operating in a competitive environment. The last time we did this was in the 1990s. Both dual-carrier operations will provide prime photo opportunities for the US to display the kind of naval power it can still wield in the face of Chinese and Russian military buildups. In each theater, the carriers are expected to double up and operate together. The Stennis and Reagan likely will cruise the South China Sea together for a time, before Stennis heads for Hawaii and the Rim of the Pacific (RIMPAC) exercises that get under way in early July. Similarly, Eisenhower and Truman will probably cruise together at least for a time, before Truman heads home to Norfolk and Ike carries on to the Persian Gulf region. Of the remaining carriers, the Nimitz is in overhaul at Bremerton, Washington; Theodore Roosevelt is in lower readiness at San Diego, having returned from deployment in November; and Abraham Lincoln is at Newport News, Virginia, in the later stages of a 3-year refueling overhaul. Another carrier, the Gerald R. Ford, is completing at Newport News. When she joins the fleet later this year, the carrier force will be restored to its mandated 11-ship level.